Lee Soke Yang facilitating a Reading Club session. It is a quiet weekday afternoon at the Bishan Community Club. Inside one of its multi-purpose rooms, a Reading Club session is in progress. Members are animatedly discussing the plot and outline of a short story. Mellifluous and lyrical Chinese phrases and idioms flow easily from a woman standing in front of the engrossed audience. She is leading the book discussion, and everyone seems to be having a good time chipping in with their comments and observations. The woman is Lee Soke Yang, 68, the founder of the Bishan Women’s Executive Committee (WEC) (part of People’s Association) Reading Club. The Bishan WEC Reading Club is just one of many Reading Clubs islandwide under an initiative by the National Library Board (NLB) called READ Singapore, which was started in 2005 to foster literary appreciation and cultivate community bonding through communal reading. Reading Clubs, which have been around for over 30 years, are formed in collaboration with organisations and community clubs to provide an avenue for people to come together to share their experiences and views on books. The Clubs have since evolved to include many diverse interest groups who have come together to share their love of reading. Besides the Bishan WEC Reading Club, the NLB has helped to facilitate the set-up of other Reading Clubs such as the Taxi Sifu Reading Club which you can guess, are made up of members who are mainly taxi drivers. There are also Reading Clubs for teachers, grassroots organisations and hospitality professionals. Reading Club sessions are not just held in libraries – but also at places like the community clubs, schools and even at voluntary welfare organisations. 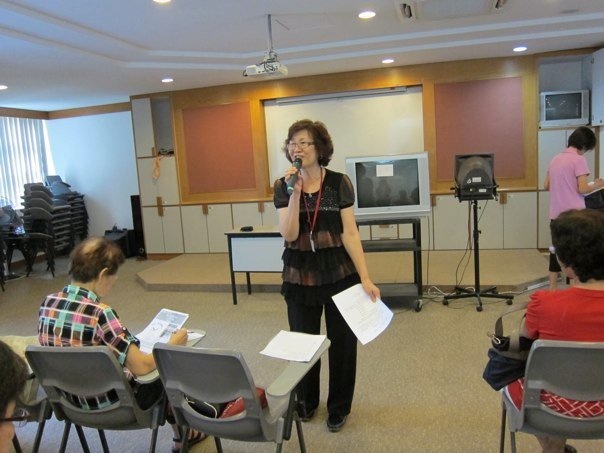 The Bishan WEC Reading Club’s Lee, a retired Chinese language teacher, has been leading and facilitating book discussions at the Bishan WEC Reading Club since its formation in June 2008. Members of the Taxi Sifu Reading Club. 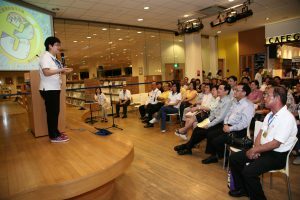 She first came to hear of the NLB’s Reading Club initiative through a radio broadcast in 2007. Her interest piqued, she began attending the Taxi Sifu Reading Club, which was started that same year. “I decided to form a Reading Club under the Bishan WEC because several of us have an interest in reading. I also want to promote a greater appreciation of the Chinese language and culture through regular Reading Club sessions and book discussions,” said Lee. The Bishan WEC Reading Club meets once monthly at the Bishan Community Club for two hours. The members discuss mainly Chinese literary works recommended by NLB such as “Lion City in the Yesteryears” by Si Jing, Zou Lu’s “Late Blossoms” and Hu Wei’s “Flying Across Continents”. The NLB will provide up to 20 copies of each book for distribution among members. Each member will then share the outline or characters of a particular short story he or she is assigned to read with other members at the next Reading Club session. Once in a while, the Reading Club will invite authors to share their experiences. At the Bishan WEC Reading Club, there are about 60 members, of which 30 are regulars. According to Lee, though most of its members are retirees and housewives, there is a 12-year-old girl who tags along “sometimes with her parents” for the sessions. A Taxi Sifu Reading Club session at Ang Mo Kio Community Library. Participating in the Reading Club sessions has built stronger bonds among the members. 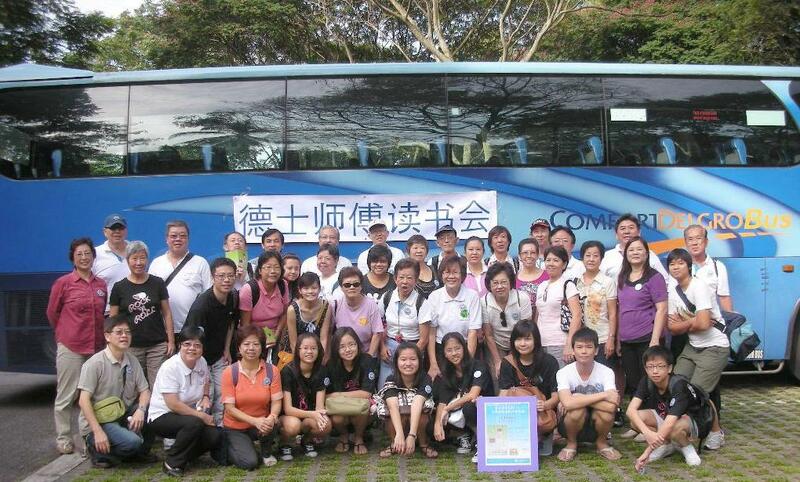 “We are like one big family here [Bishan WEC Reading Club]. In addition to building up a regular reading habit, our members also take part in the activities organised by the WEC such as walks, thus expanding their social circle by making new friends from other interest groups and activities,” shared Lee. Reading Clubs are not age-specific but are communal and formed by people with similar interests. To form a Reading Club, e-mail NLB’s Reading Initiatives team for more information at: readsingapore@nlb.gov.sg. The NLB will facilitate the first two book discussions at a newly-formed Reading Club, following which the members will take over for subsequent sessions. NLB will also supply reading materials for the Reading Club’s book discussion sessions. It also trains people who are keen to facilitate Reading Club discussions, teaching them techniques on eliciting responses from participants and managing a book discussion session. Anyone interested in forming a reading group for English-speaking seniors? Hi Sydney thanks for your comment. 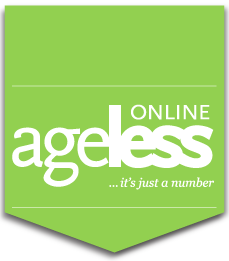 Are you keen to start a Reading Club or would you rather just join an existing one? If you are keen to start one, I am happy to post it on the Facebook page and some other networks, and help get a group together. Let me know your thoughts.